Spinning a Halloween web of books! activity I'm using with it! We are working on comparing/contrasting and character description in my room! I wanted to read 3 different Halloween books and have the kids provide the details for each and find their similarities. Spin a web of knowledge - if you will! 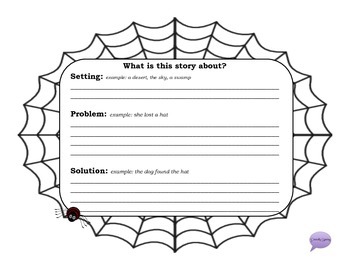 I created a packet to use with each book that focuses on characters, setting, problem, solution, etc. It can be used with a variety of ages because it has the option to write and/or draw the answers. Each student will put together a packet for each book. They can then add their details to the web that we will complete at the end of this week!